is vacant. The recruitment process shall be finalized as soon as possible. The contract will continue for 3 years. The position is part-time applicable, however it should be 100% occupied. An upgrade to 100% is possible if the PhD student contributes to the institute’s teaching duties. 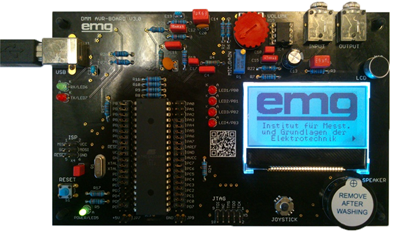 The Institute of Electrical Measurement Science and Fundamental Electrical Engineering (EMG) is involved in the Laboratory for Emerging Nanometrology – a new research center at the TU Braunschweig with excellent infrastructure. One of the research topics of the EMG lies in the field of nanomagnetism, ranging from the characterization of properties of magnetic nanoparticles to various applications in the fields of biomedical imaging, biomedicine and bioanalysis. EMG provides the PhD student excellent research environment and great opportunities of collaboration with national/international leading groups in the related fields. Your research will be part of a DFG project and deals with temperature imaging with magnetic nanoparticles. Temperature imaging utilizing MNPs is a novel noninvasive method which is of great significance to various biomedical and biological applications. The 3D temperature imaging is based on Magnetic Particle Imaging– a novel imaging modality. The research topic is an interdisciplinary study ranging from electrical engineering and physics to biomedical imaging and biomedicine. The research will be carried out in close collaboration with colleagues who work on other Magnetic Particle Imaging projects at the institute. Basic knowledge on electrical circuit design is mandatory. Knowledge on programming, e.g. LabVIEW and Matlab, is beneficial. The TU Braunschweig seeks a reduction of the underrepresentation in the sense of the NGG in all areas and positions. Therefore, applications by women are especially desirable. In case of equal qualification, handicapped/disabled persons will be preferred. A certificate must be appended. Applications from people from all nationalities are welcome. Application expenses cannot be refunded. Personalized data will be stored in the course of the application procedure. The advertised position is located in the group of Prof. Dr. rer. nat. Meinhard Schilling. To apply for this position, please upload your application via the online application site. The closing date for application: January 31st, 2019. For further information, please contact Dr. Jing Zhong (j.zhong@tu-bs.de). In Rahmen der Übung zu der Vorlesung „Digitale Messdatenverarbeitung mit Mikrorechnern“ erhalten die Studierenden eine vorbestückte Platine, die sie durch Lötarbeiten fertigstellen und schließlich zur Realisierung von Mikrocontrollerprojekten nutzen. Bei der HiWi-Tätigkeit sollen die Studierenden beim Löten der Boards, bei den Programmierarbeiten und anschließend auch beim Design von Zusatzplatinen unterstützt werden. Weitere Aufgaben betreffen die Begleitung des Bestellprozesses von zusätzlichen Bauteilen, die Pflege und Überarbeitung des DMM-Wikis und ggf. die Unterstützung beim 3D-Druck von Teilen für die Projekte. Im Rahmen des Praktikums Grundlagen der Elektrischen Messtechnik im Sommersemester werden studentische Hilfskräfte gesucht. Im Rahmen des Praktikums Grundlagen der Elektrotechnik im Wintersemester werden studentische Hilfskräfte gesucht.